These black bean burgers make it burger night! 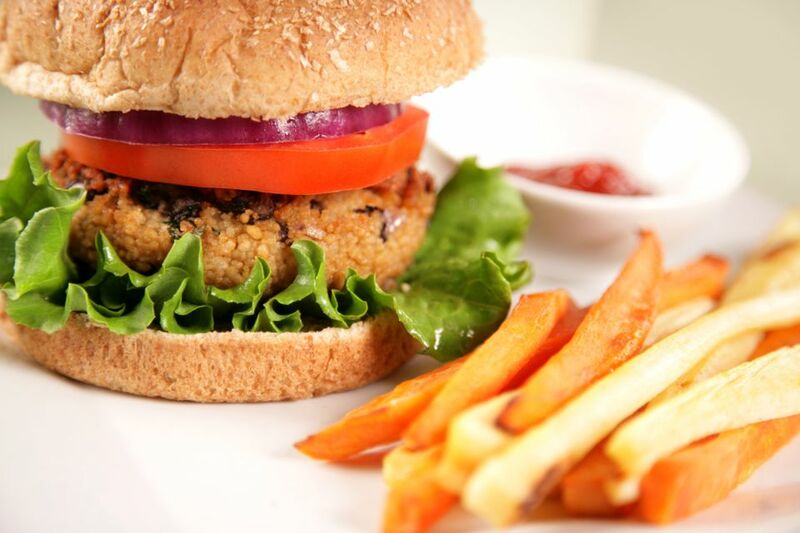 If you have never tried a black bean burger, and the thought just didn't seem like anything you would ever want to try, you ought to give black bean burgers a try. Will they fool you into thinking that you are eating an actual beef hamburger? Probably not. But they are delicious, and they do make eating a hamburger a little easier on the waistline. Surprisingly, all of the toppings that you would find on a normal beef or turkey burger go quite well on these much healthier black bean burgers. Then just serve them up with a few healthy sides like baked beans or baked oven fries or a healthy low-fat coleslaw. If you have leftovers, the bean patties can be stored in an airtight container in the fridge for a day or two after making them. Finish off with all of the normal burger toppings – lettuce leaves, sliced tomato, sliced onion, pickle slices, catsup, mustard – and serve alongside some crispy oven fries. First you will prepare the black bean patties. Place the black beans in a medium-sized bowl. With the back of a fork, partially mash the beans until they can be shaped into a patty, but they do not have to be completely mashed smooth. To the mashed black beans, add the breadcrumbs, egg, Worcestershire sauce, and black pepper, and mix well until all of the ingredients are well combined. To cook the bean patties, heat the canola oil in a large skillet over medium heat. If using the recipe as is, use 1/4 of the bean mixture for each patty. Shape each portion into disc-shaped patties that are about 3/4-inch thick using your hands. Gently form them until you get four uniform patties. Place the patties into the skillet, and cook on each side about 4 minutes, or until the patties become lightly browned and are firm. To serve up the black bean burgers, serve each patty on a whole wheat bun, and finish off with the burger toppings you desire such as lettuce, sliced tomato, sliced onion, sliced pickles, ketchup, and mustard.